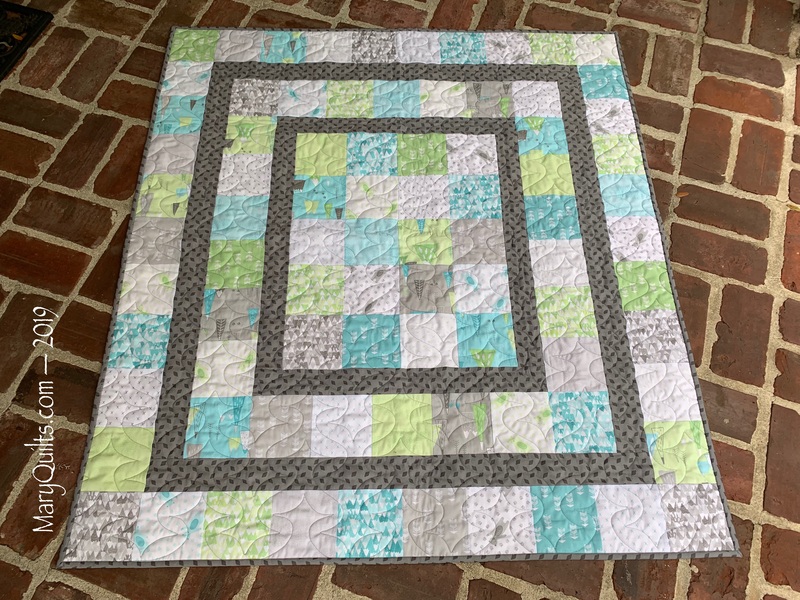 This little diamond quilt was made from Charm Squares as part of our Precut Party. I had one lone pack of squares from this fabric line so I decided I’d piece half square triangles from them and arrange them in a layout that created diamonds. Quilted with a pantograph called Wave. I like how these colors are working up and so far I’m liking the yarn too (Caron Big Cake) except that I had 3 knots in the first big skein that had to be cut out and ends woven in … kind of defeats the purpose of having big skeins! Hopefully, the next two skeins won’t be like that. 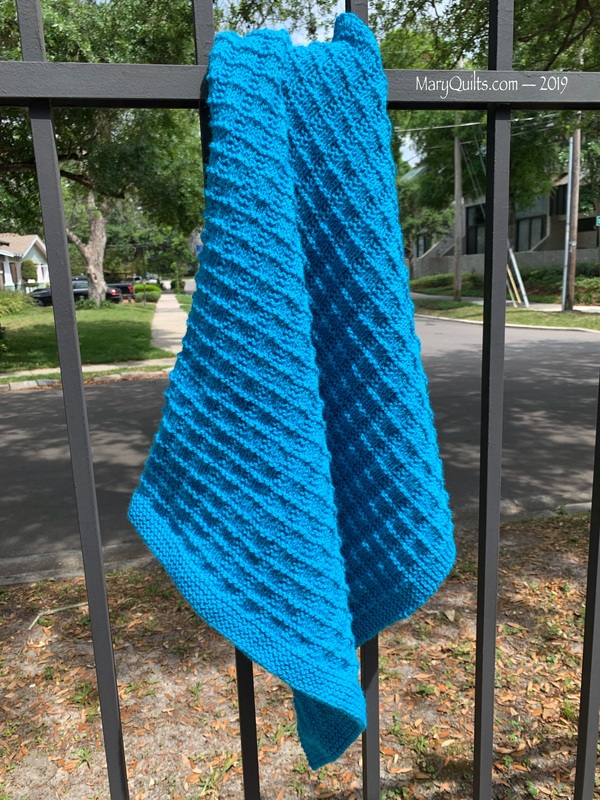 I think next time I use this yarn I’ll go up a hook size too – this isn’t bad but I think the drape would be just a little better with a larger hook. I’m 1/3 of the way done with this one. One thing I like about this yarn is it’s an easy care acrylic, that’s a good thing in a donation blanket! I was asked if I cut the yarn so the colors change at the row beginnings but nope, I’m not that worried about the color changing in the middle of rows and I’m not going to doing anything that creates more ends to weave in!! You can see a color switch in the photo below but I really feel they aren’t that noticeable when you look at the Afghan as a whole. I finished another binding last night but no photo yet, the assembly of the Hexagon Flower top is in progress, and I pieced a back for the next top to get loaded on the longarm. I finished a little quilt earlier this year from a single Jelly Roll that I’d gotten from Craftsy and I’ve been thinking about making another one – I haven’t calculated how many 2.5 inch strips this one would take but the block size is 12 inches finished and the quilt size is 60×84. I wanted to see how it would look alternating blue and red framed blocks … I’d go scrappy with my strips of course but it’s easier to draft in just 3 colors. This may be my Jelly Roll project the next time Stephanie pulls Jelly Rolls out of the hat for our Precut Party. In addition to playing around in TouchDraw drafting quilts, I’m doing some binding and am ready to start sewing my Hexagon flower and 9 patches together – all the blocks are made/appliquéd. After spending an hour looking at crochet patterns, I decided to start another Ripple Afghan. 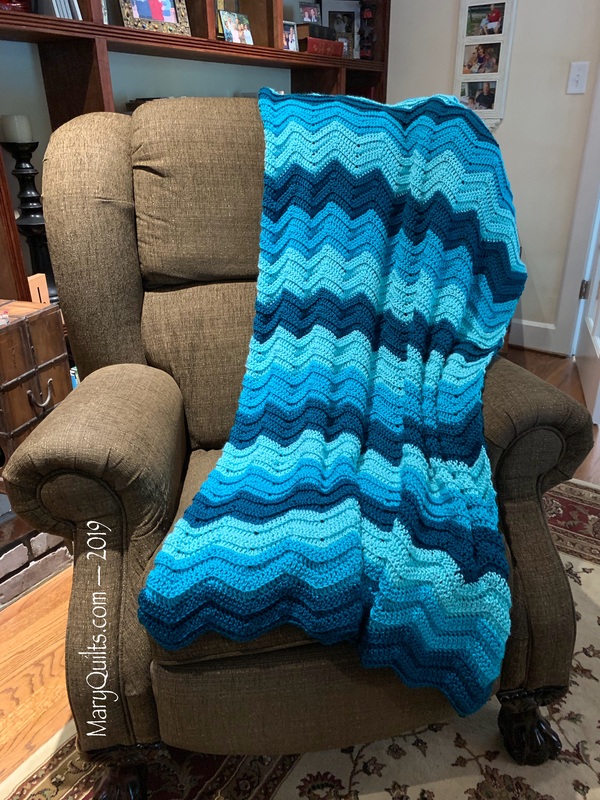 This time the yarn will do the work of creating stripes for me and I’m crocheting in both loops versus just the back loops that created the ridges in the blue Afghan I just finished. I love having a flurry of finishes, it makes me feel very productive! This little afghan was knit and has waited a few weeks for me to finally weave all the ends in, it will also be donated. It was knit from a pattern in this little Plymouth Yarn booklet and the texture and color show up a little better in this photo. Finished AND all the ends woven in already!! 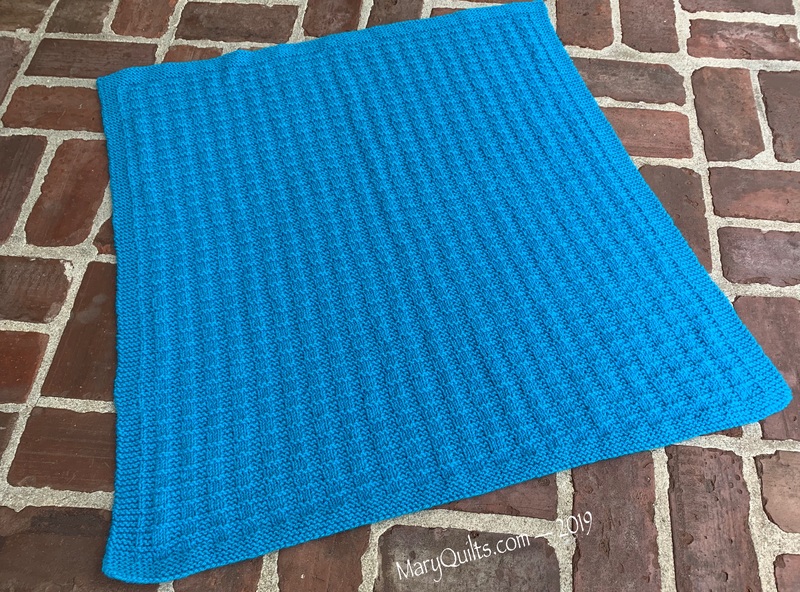 This crocheted Ripple Afghan was a free pattern found on Ravelry. 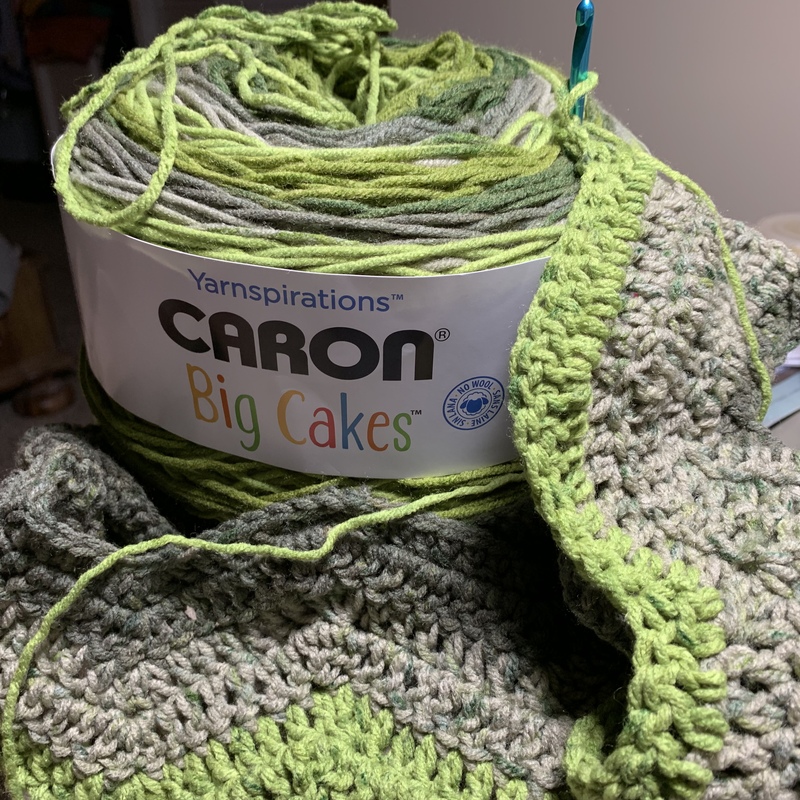 Yarn is Caron Simply Soft — it’s a quick project to crochet and took me just about two and a half weeks. It will be donated. I finished binding this little charm square quilt a few days ago but just got a photo today. 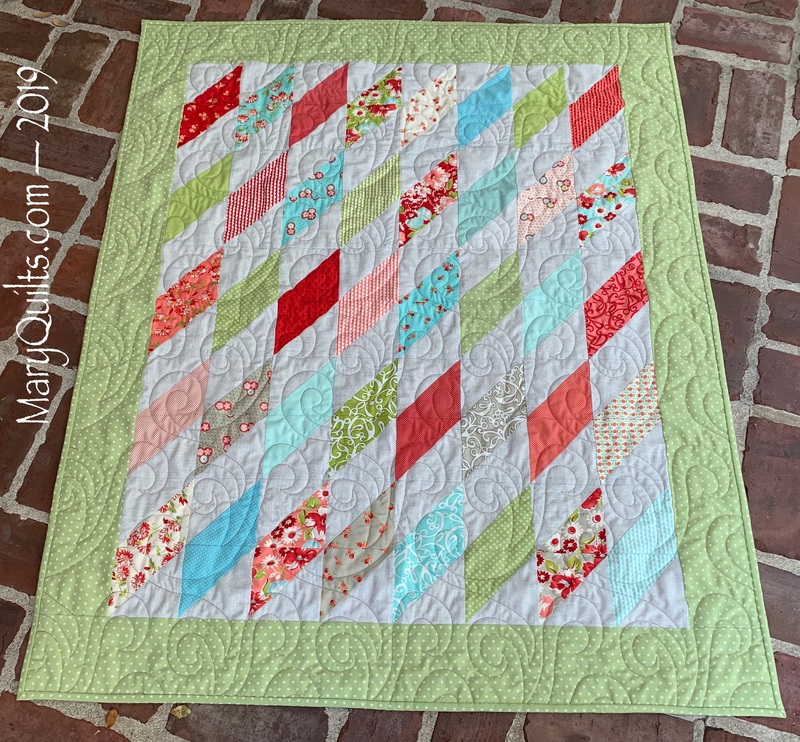 I can’t remember where I saw a similar quilt – maybe the Moda Bake Shop or Craftsy but I didn’t use a pattern for this – just 2 packs of charm squares and the borders that were cut 2.75 inches wide. Quilted with the pantograph Leap Frog from Norma Sharp but after searching, I can’t find a copy of it anywhere – I bought it years ago at a quilt show. The quilt finishes at approximately 45×49 inches which is a nice size lap quilt even for an adult sitting in a chair (I tried it out for size after finishing the binding) but it’s easy enough to upsize if you wanted to by just using more charms.